Objective: To import an audiobook from a set of CDs into your iTunes library. Each CD in the set is converted to a single audio track in iTunes (about 70 min.) that is bookmarkable. That is, if you stop listening in the middle of a track and return later it will resume playing from the place you left off. Once in iTunes, the tracks can be copied to your iPod or iPhone. There are several sources for audiobooks, but the following describes importing them into iTunes from a set of audiobook CDs. In March 2007 I wrote about this topic. Since then iTunes has improved and and the process of importing books has gotten simpler. I describe the steps to convert a a set of CDs that comprise an audiobook in a set of audio tracks that I can transfer to my iPod. This is my personal approach. Others may do it differently. Start with a set of CDs that comprise an audiobook. This could be one CD or twenty, depending on the length of the book. Insert the first CD in the CD drive. iTunes will open automatically if it’s not already open. The CD will show in the left sidebar and it’s tracks appear in the library window. Audiobook CDs can have as many as 99 tracks. Make sure that iTunes preferences is set NOT to begin automatically importing when a CD is inserted. Occasionally a disc is slow to mount. Open Disk Utility, select the CD and "Mount". Most commercial music and audio CDs are cataloged in the CD Internet database, CDDB. If it's listed and you are connected, the information can be transferred to the iTunes tracks. The title will show in the sidebar and other information about each track, Track number, Album, Artist, Date, etc. will show in the main, library window. Customize the layout by going to View>View Options. CDs can have as many as 99 tracks, so it's useful to convert all of them to a single track in iTunes. For example a 4 CD book will wind up as a 4-track album as shown in the figure below. The CD name will usually show in the sidebar as the book name appended with a CD number, e.g. 1, 01, [Disk 1], 1/4 or such. I usually shorten this, changing the CD name to the title with a single CD number, as shown above. If the CD is not listed in the CD database, enter the name and number manually. In iTunes Preferences set the Import Settings to 32 or 48 kbps AAC with VBR. This gives good quality for the spoken word, but keeps the file size small. Experiment with your settings and listen. Select all the tracks in the main iTunes library window and select Join CD Tracks from the Advanced Menu. It is important that the tracks are ordered by track number, shown in the first column, and that contiguous tracks are selected. Click the Import button. iTunes will join all the tracks, converting them to a single AAC track in the library. When importing has finished, eject the CD and insert the next. Repeat the process. When all the CDs have been imported you’re finished with them. Put them away. Find the imported tracks in iTunes. An easy way is to sort by Date Added or type a few key words in the Search box. Select the first track and select File>Get Info (Cmd-I). Select the Info tab. In the first Track Number box type 1, if it's not already there. Click the Next button and do the same with the next track number. If you named the CDs as described above the track number should appear in the Name box. Don’t bother with the other boxes, we’ll take care of those in a batch operation in the next step. When you’re finished with all the tracks, click OK. 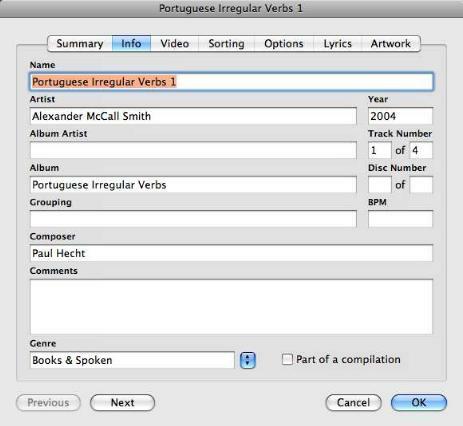 In the iTunes Library window select all the tracks for the book. Select Get Info again. Make sure the Artist’s name is in the Artist box. In the second Track Number box type the total number of tracks (same as the number of CDs). In the Album box type the Album name. Disc Number has no meaning. Add/change any other information you want to apply to the entire book. Click the Options tab. Set the Media Kind to Audiobook, No to Compilation and Yes to Remember position. Then click OK. You're finished. This final step converts the files from music files (m4a) to audiobook files (m4b). They now appear in the Audiobooks library in iTunes, rather than the Music library. A most important feature is “Remember Position.” Each audio track is now about an hour long. If you stop listening in the middle of a track and go do something else you’d like to be able to return to where you left off. Remember position bookmarks your spot and lets you do that. You can also convert the files using an Applescript called "Make Bookmarkable" from Doug's Applescripts. Coda: If you do a lot of messing around with audio, as I do, particularly compressed audio, a couple of programs I use and recommend are Amadeus and MediaRage. They're not free, but not expensive.